Well, it’s been a while since we’ve hit the steel scene in NY State, but the itch was there, and it needed to be scratched. This trip, instead of bouncing eggs and nymphs, the plan was to swing streamers with two-handed rods. Despite the far from optimum time of year to use this technique – that was going to be our plan. If you’ve been following the weather, I’m sure you notice the lake snow activity-taking place along the east shore of Lake Ontario. Well, we were in the middle of it. Close to a foot and a half of snow fell over the course of the time frame on the water. So you can no doubt that the water was under 40F. Air temps did not get much above 35F. The general gist of our fishing was to get the fly down deep, and quick, but swing it slow through the eddy water. 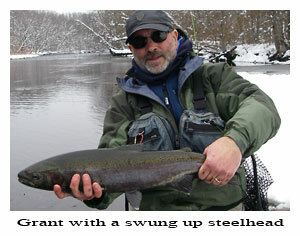 We used Skagit heads – 500 grains or so, on 8wt rods. Off the head were added a sink tip – 10’ (t8-t10). Mix in a weighted fly and you’ve got the general idea of our rig. November 17, 2012 - We Are Back! 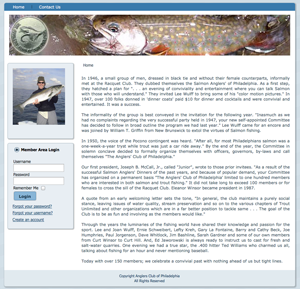 So the Lehigh ended the season, just like it started - with dry fly action! We are talking March through November - with fish eating on-top all year, except for those 'dog days of summer,' days. Not too bad, depsite the hot summer we had. Timely rains, and no doubt the augmentation from Walter helped. Being able to carry a 100cfs over inflow release from Walter just about all summer long, regardless of release temperature (up to a point) helps immensely. 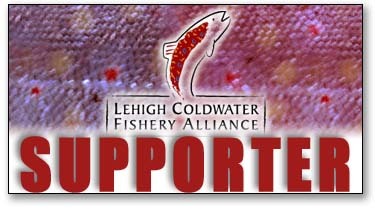 The Lehigh Coldwater Fishery Alliance is giving a Lehigh River presenation at the Anglers Club of Philadelphia - November 13, 6:30pm at the Philadelphia Racket Club. For all you Philly people, come on out and see what is going on!